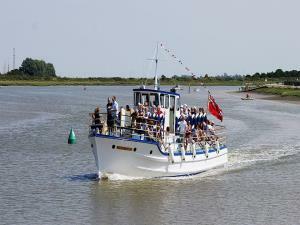 This traditional pleasure boat was built locally in 1947 and, following a complete restoration, is once again offering trips around the estuary. Moored at the ‘little blue jetty’, the Viking Saga is the best way to view both the Hythe Quay and the attractive fleet of Thames Sailing Barges. Hop on board and enjoy a 40 minute trip with full commentary from the knowledgeable skipper as you make your way along the estuary. You will pass Northey Island, site of the Battle of Maldon and see Heybridge Basin, bustling with maritime activity. Trips take place on the tide, so there are always lots of other craft on the water to look out for and keep pace with. Longer excursions lasting 1 ½ - 2 hours are available, exploring Osea Island and offering extensive views of the estuary and creeks.